"Time is your most valuable resource!" said internationally known management expert Peter Drucker. Then he made a very astute observation: "Unless time is managed, nothing else can be managed." In other words, if time gets away from us, every other part of our business will get away from us, too. Take all of your professional expertise and resources, and add to them all of your opportunities, then divide them by the work you can get done in the time you have available. That's your earning quotient. If you think in these terms, it quickly becomes clear that it's not our knowledge and expertise that make us successful. That only gives us our capability to succeed. And it's not our opportunities. Those only represent our potential. What makes the difference in our level of success is how effectively we utilize the time we have available. What's exciting about that formula is that even a small increase in your time utilization can give you a quantum leap in earning power. So, when we're talking about effective time management, we're also talking about making more money. And, notice that I'm putting the emphasis on minutes, not on hours. Time seldom gets away from us in big chunks. Usually it slips away in minutes and even seconds. So, to increase your focus on billable minutes, keep a time log for a week. Divide it into two columns -- billable minutes and overhead activities. Write down all your activities in at least fifteen-minute increments. Then, at the end of the week, total up all the time for each of the columns. I predict that your first reaction will be shock! You won't believe how much overhead time you've amassed. If you really want to get a clear picture, figure out exactly what your time per hour is worth and total up the dollar amount the overhead activities have cost you. Then take that amount of money out of your pocket and throw it in the trash can. Make it a habit to bring every task to closure as quickly as possible. There's a phenomenon I like to call the entrepreneurial syndrome and, since most professionals are entrepreneurs by nature, it's easy to fall into it. The entrepreneurial syndrome is working like crazy, but not getting a whole lot done. Unfortunately, your customers don't pay you by the speed of your work, or usually even the number of hours you put in. They pay you for what you accomplish for them. "I'll look into it and get back to you." "I really need to do something about that." "We need to get our heads together." Or, here's a classic: "I really haven't had time to do it, but I'm working on it right now!" These statements indicate that we have so many things hanging that we can't bring anything to completion. They are public relations ways of saying, "I'm working as hard as I can, but I just can't get it all done!" And, if you really want to be proactive about it, set results-oriented goals for each hour of your day. Instead of saying, "I'm going to block out three hours to work on those estimates", say, "I've got three hours available, so I'm going to finish those estimates." One reason so many professionals fall into the entrepreneurial syndrome is that they feel so much pressure that they have to do something to release it. For example, they rush to the office and sit down at a desk. Then they start looking for the most pressing thing to do. And, usually, they can release the pressure they feel by tackling some simple, routine chore like opening the mail or returning phone calls. Two hours later, they're still caught up in overhead work, instead of making calls, generating sales, and earning income. 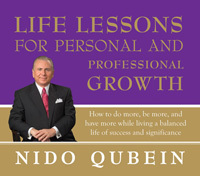 Through an understanding of behavioral economics and sound life balance principles, Nido Qubein shares the standards through which he leads his personal life and business career. Learn the principles of training vs. education; diversification vs. hedging; and confidence vs. authority.